Once again a new year turns and 2016 brings hope of exciting new convertible cars ahead. The market continues to evolve, with a continuing shift towards the high end where the limits to what people are willing and able to spend are pushed even further from the reaches of the average car buyer. While the Asian market for luxury cars is currently in decline this has had little effect on convertible sales as this type of car has never ben popular in the region. Among the new convertible cars for 2016 is something for most buyers. Consumer confidence is building in North America and Northern Europe and with this, we are starting to see a few more interesting cars being developed at the more affordable end of the market. The Vauxhall/Opel Cascada has crossed the water from Europe to America and being sold in the US as the Buick Cascada. This four-seat convertible has a good size interior and a quality feel and yet the price is more appealing than the premium brand alternatives. The rather lovely little Mazda MX-5 Roadster has been well received but has not really shaken up the industry despite a rather attractive entry price, while its twin, the Fiat 127 offers a similar experience in a more retro-styled package. The market for small city cars with big panoramic sunroofs is blossoming with the Renault Twingo now offering a similar kind of ‘almost-convertible’ roof as the Fiat 500C, Peugeot 108 Top, Citroen C1 Airspace, Toyota Aygo and Vauxhall Adam. At the other end of the market, 2016 is set to be a record year among high-end luxury convertible cars with Rolls-Royce, Bentley and Mercedes-Benz delivering new levels of opulence and there are some exciting performance cars promised too. The Audi A5 has long been at the heart of their range of convertible cars and the latest B9 generation car seen under development looks to be more of the same. A fabric roof covers an elegant new body shape. Nothing too radical but you will be able to tell it apart from the previous B8 model. We might see the launch at a motor show towards the end of 2016 but it won’t be on our roads until at least 2017. Engines will be ever more efficient and you can expect S and RS performance versions in time. 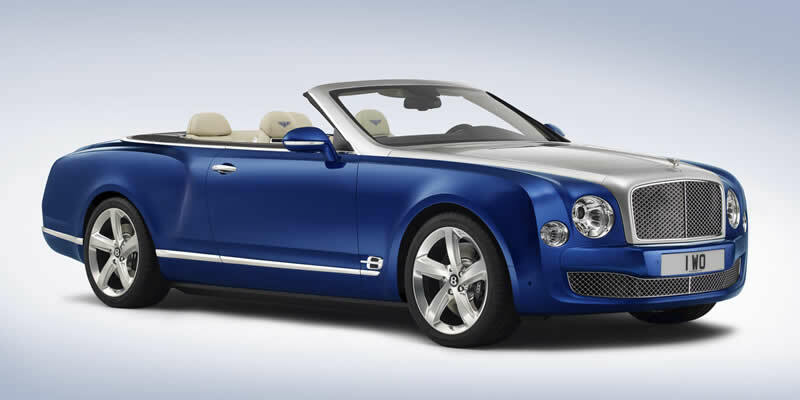 Bentley’s most opulent convertible car yet will mark the top of the luxury car brand’s range. Based on the solid Mulsanne platform, the Bentley Grand Convertible will be hand finished to the buyer’s specifications and will only be available in limited numbers. The design shares many similarities with its older rival the Rolls-Royce Phantom Drophead. Reflecting the brand, however, the Bentley is likely to have more sporting flavour to it. The Mulsanne Speed’s 530bhp and 6.75-litre V8 engine should provide ample performance while a multilayer fabric roof can shut away the outside world when required. We were a little eager to expect this car in 2015 but if it is built at all it should be with us in 2016. The next generation BMW Z4 Roadster has been spotted in final development and should be revealed to the public during 2016. It makes a return to a lightweight and less costly fabric roof. The classic roadster proportions remain but underneath the platform which has been developed to also be used in the forthcoming Toyota Supra, is expected to share the weight-saving composite technology used in the BMW i3 and i8. This suggests a return to classic Bavarian agility and potentially smaller turbocharged engines and hybrid options. There is even a possibility that it could become a baby i8 – perhaps badged i4. Expect some modern styling influenced by the i8 hybrid sports car and the Vision ConnectedDrive concept pictured above. Announced last year, the Fiat 124 Spider won’t be available until the Spring of 2016. 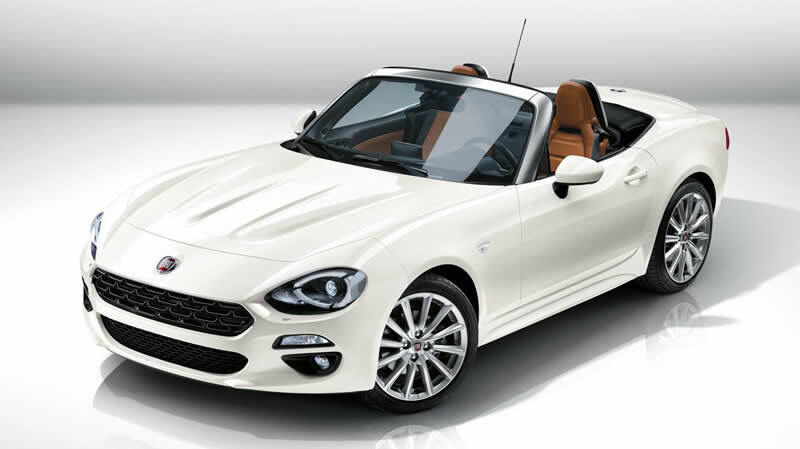 Fiat is hopeful that some of the roadster’s glamour will rub off on the rest of the range which is dominated by variations of the 500 hatchback. Developed along the evergreen Mazda MX-5, the 124 Spider shares its agile chassis but with more glamourous retro styled bodywork. It also gets a different range of engines so that despite gaining a few extra pounds it will be more powerful than its Japanese sister. The launch car gets a 140 horsepower 1.4 turbocharged mulitair petrol engine while there is scope for a more powerful Abarth version in the future. 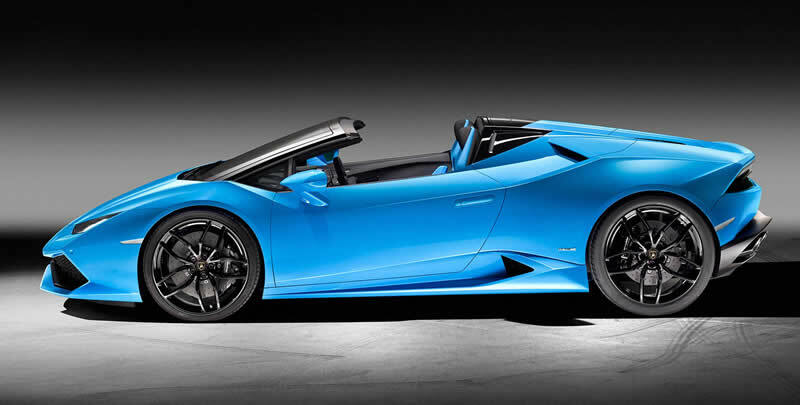 Known more simply as the SV Roadster, the Lamborghini LP 750-4 Superveloce is the wildest Aventador yet. No expense has been spared to make weight savings and performance gains to ensure the first convertible Lamborghini to wear the SV badge lives up to everything it promises. The new exhaust system is highly vocal about the 49bhp power gain over the standard car (taking it to 740bhp) and the lack of soundproofing in the stripped out interior won’t hide it either. Raw carbon fibre features around the car and big forged alloy wheels show its road-racer intent. Intense power and precise handling go hand in hand for serious driving enthusiasts. 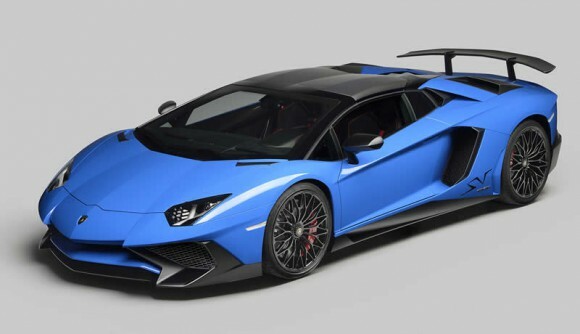 Only 500 of these Aventador SV Roadsters will be built and each will sell for GBP £350,000 or around half a million dollars. The Lamborghini Huracan Spyder goes on sale in the Spring of 2016. It has major dynamic improvements over the old Gallardo Spyder with a 40% stiffer chassis but must still compete with the latest stars from Ferrari and McLaren. Unlike these competitors the Lamborghini continues with all-wheel-drive, featherweight fabric roof and 5.2 litre V10 engine but the blend has been spiced up with the latest tech. Emissions have dropped while power and torque make thumping gains. The Spyder matches the Coupe’s figures of 602bhp and 413 lb-ft but looses 0.2 seconds in the sprint to 60mph due to chassis stiffening weight gains. Still, a time of just 3.4 seconds should satisfy most drivers as they head towards the 202mph top speed. 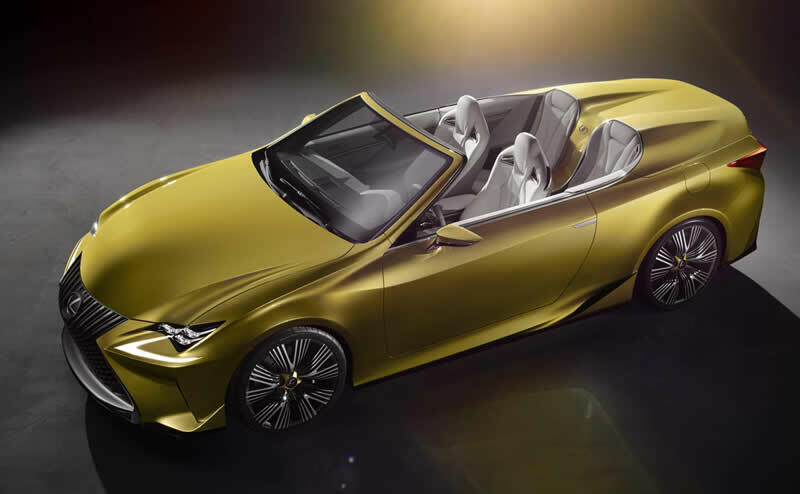 A potential successor to the IS Convertible was shown back in 2014 in the form of the Lexus LF-C2 concept. This carefully finished car was closer to a production-ready road car than most concepts but at the time had no sign of any roof design. It would likely share a platform with the RC sports coupe and compete with premium convertibles such as the BMW 4-Series and Audi A5. Going head to head with the upcoming B9 Audi A5 and BMW 4-Series Convertible which has the market much to itself for the last year, The Mercedes C-Class Cabriolet will be a new push into the world of premium convertibles for the respected brand. We expect it to take the place of the E-class Cabriolet in the range despite being a little smaller and cheaper. 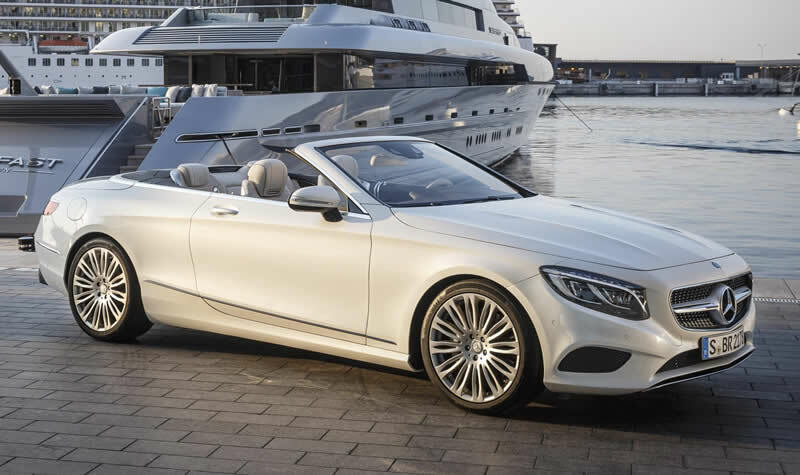 The move clearly defines the new S-Class Cabriolet as the most desirable in the range while the less expensive C-Class will sell in much higher numbers. A future AMG version seems likely once the standard car has been launched. The grandest of convertible Mercedes’ the S-Class Cabriolet was launched to go on sale in time for the Spring of 2016 with S550 and S63 models being joined by a top of the range S65 AMG packing a twin-turbo V12 by the end of the Summer. This large convertible has all the luxury you might expect and has the quality and performance to challenge competitors from Bentley and Maserati. 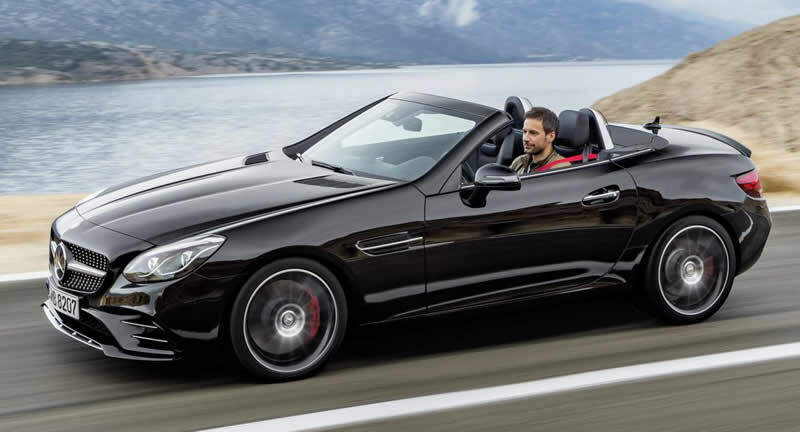 The Mercedes SLK Roadster gets a facelift and a name change for 2016 with the SLC name, once given to the Coupe version of the SL sports car, being recycled to fit with the German brand’s new naming strategy. This time, the C stands for C-Class in the same way as the GLC is the SUV of the C-Class range. New lights, a more aggressive front end and an upgraded interior will keep this small convertible sports car competitive for a few more years. The AMG version gets a smaller, more efficient engine which means we have to sadly say goodbye to the lovely old V8 but hello to a lighter, more agile 6 cylinder sports car. 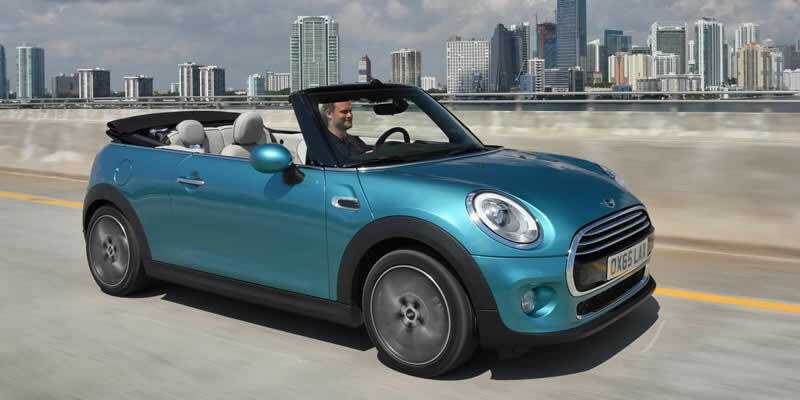 Among the new convertible cars for 2016 is a new Mini. While it looks much the same as the previous generation, this is an all-new car. Bigger in every dimension, most crucially in the luggage capacity which increases by 25% with the roof down. A neat new rain warning app on the dashboard mounted screen alerts drivers when a storm is approaching and it’s time to put the top up. The classic fabric roof is retained but is now offered in an optional embroidered Union Jack herringbone pattern. The Roadster version of the Pagani Huayra has long seemed the logic progression of the beautifully crafted supercar. The hardtop car has finished its production run leaving space for an even more extreme successor. The specifications are unknown at the time of writing but expect it to be powered by a version of the AMG-built turbocharged 6 litre V12 within its perfectly balanced carbon fibre chassis. The all-new Boxster comes with turbo-charged four cylinder boxer engines throughout the range, a radical change from the previous 6-cylinder normally aspirated cars. The roadster also gets new bodywork although in true Porsche style it is hard to tell from the earlier models. Despite the downsizing in capacity power and performance take a step up, as do prices. 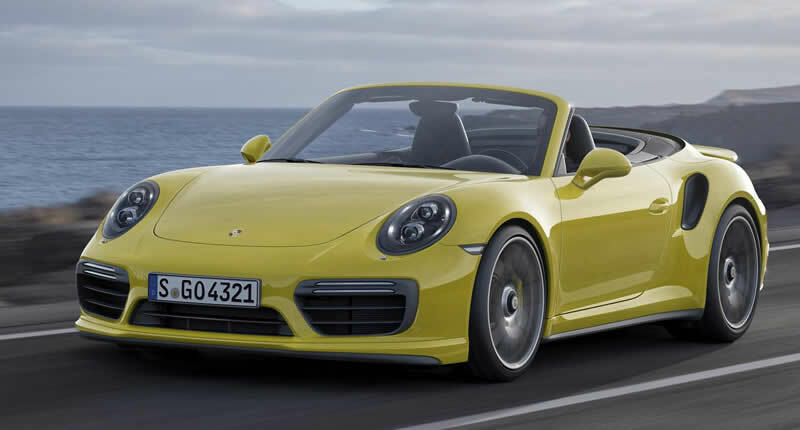 The next generation Porsche 911 gets another subtle visual update and turbocharged engines throughout the range. This ups the power while keeping fuel economy and emissions well under control. Performance is as impressive as ever and the cars ever more capable but first impressions suggest they may be a little more remote when it comes to driver feedback. The convertible SUV has always seemed a strange concept but to those with California beach-front properties it makes perfect sense. 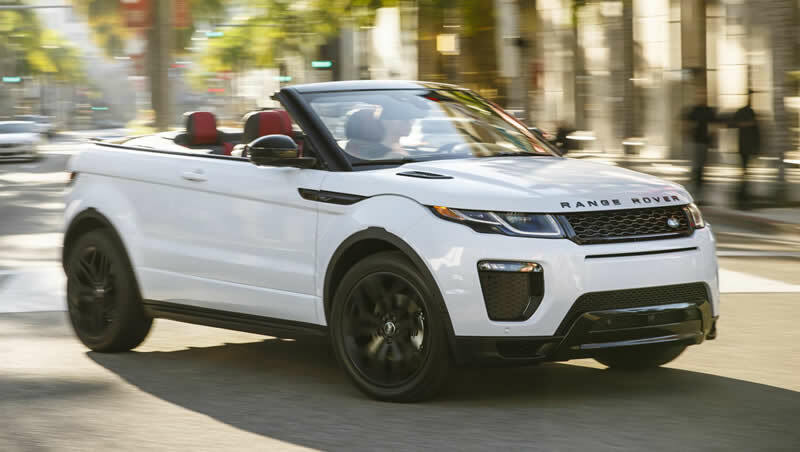 Land Rover are hoping that such people will be rushing to dealerships this year as the Range Rover Evoque Convertible is released. The big power-folding five-layer fabric roof makes it an all-weather car and the terrain response all-wheel-drive system can cope with almost any landscape you might want to venture into. Four seats and ample luggage space add family practicality. If you really do want a one-fits-all solution to transport then this has to be it. Since the Wraith coupe was introduced we had been expecting a convertible version. The Rolls-Royce Dawn will be more sporting and perhaps a little more affordable than the Phantom Drophead but have no doubt it is among the finest of luxury drop-tops. Finished to a detail that only Rolls-Royce can achieve this elegant machine will sit alongside the Phantom Drophead in the range but may take over from the older car in time. The new Smart ForTwo Cabrio is a great little city car that combines the practicality of a nippy, economical micro-hatchback with the fun and style of a convertible. It is cheap to run, with emissions low enough to avoid taxes in many cities. The ForTwo is the smallest convertible on the market and yet the roof opens right back unlike many of its competitors. 220,000 Cabrio’s of the previous generation were sold around the globe and this one is likely to be just as popular. Smart are seeing big sales growth at the moment with the Cabrio adding some desirability to the range. A convertible version of the new Audi R8 is in the works with the latest sharp-edged styling. The test car appears to have a very similar fabric roof to the old car with twin buttresses extending over the engine cover and a retractable rear window. A choice of V10 or V10 Plus powertrain options in the taught all-wheel-drive Lamborghini-derived chassis and a weight loss of around 70kg from the previous model promise a great drive. Another one that remains just a possibility but one that would likely go down well with BMW’s M-Sport customers. The M2 Coupe was recently released so a convertible version is unlikely to appear before early 2017. The M2 is looking like an impressive performance car with handling to match its power output. Comparisons with the original M3 are very likely. Update: BMW Chief Engineer Frank Isenberg was quoted to have said that there was no room in the range for an M2 Convertible as the M235i Convertible was fast enough. He didn’t go as far as saying that the open-top chassis was not stiff enough to take the extra power but did mention “We need to keep it as purist as we did with the 1 Series M Coupe”. In 2014 Cadillac dealers were consulted over their opinions of a potential convertible model. The response was positive but we have heard little since to suggest this car is anywhere near production. If it comes, it would certainly restore some desirability to this premium American brand. Maserati is finally making great cars again and the brand has regained serious value. While so many competitors have become watered down by adding mass-market models to the range the Italians have reserved their badge only for the wealthy enthusiast. Their stunning Alfieri sports car should make a big impact on the market, making competitors from Porsche, Mercedes and Jaguar feel much less exotic. The Coupe version should arrive in 2016 but the Convertible may not be launched until the following year. 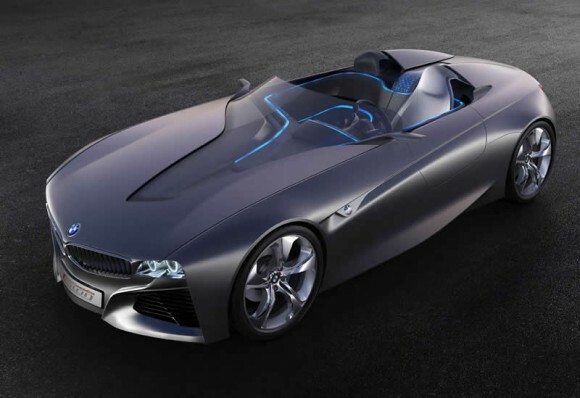 The Alfieri Roadster may be the only convertible in the Italian brand’s range once the GranTurismo is replaced in 2018 with only a Coupe option. © Copyright 2016 Convertible Car Magazine. Any idea if peugeot will bring back the hard top convertible in the future ? 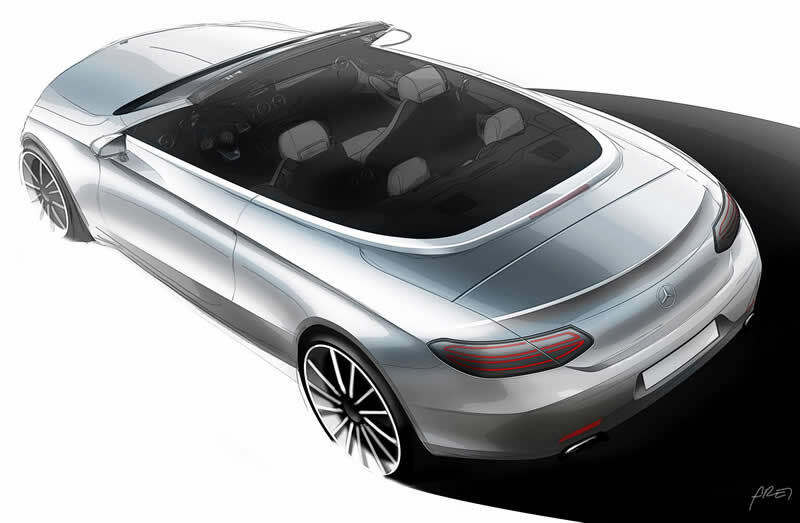 Convertible Car Article - New Convertible Cars for 2016.